At other times we put off tasks for the opposite reason – we believe it won’t take us long at all – so it can be done anytime. It’s funny how these tasks often end up being more complex and time consuming than expected. I’ve personally pulled a few all-nighters as a result of putting off these so-called easy tasks. 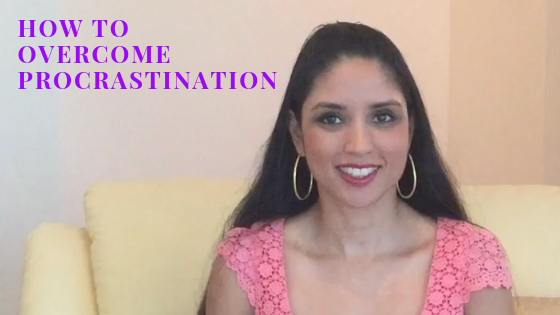 In the video above, I shared a simple tapping sequence you can use to overcome procrastination. The best time to use this script is when you’re sitting around procrastinating or if you feel a sense of dread about an upcoming task you need to start. Tapping will neutralise your physical and mental energy around procrastinating so you can approach the task with all of your excitement and brilliance. The best way to measure the effectiveness of tapping is to rate how intense your procrastination feels on a scale of 1 to 10 (where zero means ‘not at all’ and 10 means ‘extremely consuming’. By recording your Intensity Score before and after tapping, you can measure the change. “Even though I feel stuck and irritated and I don’t feel like getting this done, I completely love and accept myself”. Setup statements are expressed while tapping on the karate chop point to open the tapping round. Although they are not compulsory, setup statements can act as circuit breakers to quickly shift you out of a negative state. To get the most out of tapping, I recommend running through the neutralising script several times until your Intensity Score drops to a zero. Even though you’ll be expressing negative phrases, tapping is a totally safe way to express your most negative thoughts and emotions without worsening what you’re experiencing. It may take a few attempts before you overcome procrastination completely, however the good news is that you can follow this tapping sequence anytime you feel the urge to procrastinate. Over time you will permanently break your cycle of procrastinating and you will become a master of the common denominator of success. Comment below and let me know how many neutralising rounds it took for your intensity score drop to zero.